And what better way to recall the events of this week than with some scathingly brilliant cartoons, and some deeply moving pictures? The msm doesn’t concern itself with trifles, such as facts. I will say that, having ventured over to News Radio for a few minutes this morning, the only political news I heard was reportage on the Liberals’ new budget black hole. With a quote from Penny Wong saying Abbott pledged to cut something that’s already been handed over to commercial funding. I think I overheard the same piece of news on one of the music stations as well. If that’s the take-out message from Abbott’s budget reply, that’s fine with me. Perhaps c@tmomma might be able to enlighten us after she returns from her trevails today. But it would appear to me that the Labor caucus may have pledged to be united with some caveats attached. As we all are aware, it has been a fractured caucus for longer than we care to admit. Ditto on ABC24 at noon. Btw there are two distinctive images of Abbott. One is kneeling next to Murdoch who is sitting down, and the other is Reinhart either talking into Abbott’s ear, or the other way around. Social medial should be inundated with those images on a daily basis. this guy has form and he will never change. Decency and Abbott in he same sentence – pfft!! It was my understanding that a certain percentage of gallery seats were reserved for people to book them on the day. When I last attended question time, I booked 3 seats in the morning, and returned in the afternoon to find a long queue of people still lining up to book their seats. We went straight to the front, as we had pre-booked. Therefore my question is: how could the liberal party have had the ENTIRE GALLERY filled with their stooges? That had to take careful organising. It needs to be investigated by a senate committee. It was a blatant misuse of Parliament. Of course, Anna Burke should have interrupted Abbott’s address to demand that the gallery remain quiet. And if they continued to applaud etc, she should have had them removed. That’s what Peter Slipper would have done. So it’s a bad mark for Anna Burke in my opinion. The Abbott address could have been allowed to run overtime. But when did the dictates of a 30 minute TV time slot come to take precedence over Parliamentary protocols? Abbott’s allowed to bite, gouge, use chains, broken bottles & knuckle dusters if he wants to. And he’s applauded for it. On ABC 24 Labor were saying the Libs will increase the GST- but ABC have a statement from Christopher Pyne ( who recently lied on the doors about Michelle Rowland’s requesting a pair to be with her sick baby) ASSURING them that they wont. Credible? I don’t think so. But see how they do it any assertion by Labor is immediately countered by the LIbs. I suspect if Anna Burke did anything like you suggest, it would have suited the LNP perfectly. It would have been the distraction the LNP would have adored. As it is, whoever did not watch it, is none the wiser. On the other hand, had it become an issue on the night, the Australian electorate would still be hearing about it. I am happy with how it was handled. I dont know if Abbott has really convinced the electorate to give him a go. They soured on Latham at the eleventh hour. Still think Abbott makes people uneasy. one reason why Abbott seems tl gets away with his conduct is due to the simple fact he is male. I stand by my belief that in part Labor is struggling at present due to PMJG being female. I know some scoff at this, but what I have observed over the past three years, have firmed my belief of same. 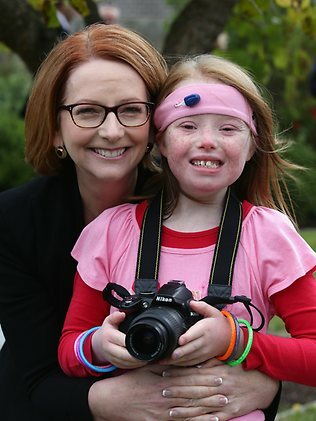 For eg., how do you think the msm and the wider public would view PMJG to be out and about in her swimming gear or in lycra riding a bike. Think about it? I understand the logic behind your point. You are right insofar as it goes. But there is a more important issue at stake here, and I could use the word “appeasement” to describe it. There is a great danger that in allowing dirty tactics like this Parliamentary stunt to go unchallanged, we are acting like Neville Chamberlain to Tony Abbott’s Hitler. The niceties must now be dispensed with. Abbott is practically a fascist, and we must confront him and call him for what he is. If there is any truth to my assertion, then the public will react accordingly. Whether it will change enough minds to change the prospective vote is another matter. But I for one would rather lose fighting than lose appeasing. For Burke simply to have silenced the gallery wouldn’t have given the Libs any advantage. Just a reminder of the protocol and a warning that it will be enforced was all that was necessary. It did seem a bit odd seeing it allowed to carry on. There must be a reason, but I don’t know what it is. Re your point about the PM’s gender. I do believe you are correct. A woman has no right to be the CEO of this country. Or words to that effect. Many men I know have told me as much. The narrow-mindedness is truly appalling. What’s depressing is that it’s an attitude almost impossible to change over a short time span. It will change – over some generations. But September is oh so close. It’s an intra cross-post (is there such a thing?) of my long comment from earlier this morning that took so much time to write we decided to put it up as a post.